Assimilation begins with a person’s first visit to your church and ends when that person becomes connected to and engaged with your church. But it is possible, however, for someone to join a church without ever truly making a connection. But you can’t steward someone without a relationship. Assimilation connects people to your church through relationships – so a church that does assimilation well will also create strong disciples. So churches employ a variety of systems designed to help them carry out their mission because while assimilation is all about human interaction, systems help us identify and connect with real people and develop a growing relationship with God. Hospitality: Do you leave the door open for guests of your home to walk in, or do you greet them at the door and warmly welcome them into your home? Church hospitality is much the same. Feeling welcome is due largely in part to feeling comfortable and familiar – and first-time visitors don’t know how to find the restrooms, check their kids into the nursery, or get to the worship center. And there are two ways to deal with hospitality – passively and actively. Passive hospitality provides directional signs and information for newcomers that make navigating the church easier. But active hospitality calls for action. It welcomes newcomers with people available to greet and help anyone entering your doors. Information Gathering: When churches gather information, they often pleasantly find that they had more visitors than they realized. And while hospitality is hard to quantify, gathered information is easy to measure. Churches that gather information will fuel their ministry opportunities and make each person feel more valued and known. So with accurate metrics, a church can not only know their attendance numbers, but also the number of new visitors and recognize changes in the attendance patterns of their returning congregants. Think of it like this: If hospitality is the heart of your system, subjective and qualitative by nature, then information gathering is its head, objective and quantifiable – and actionable with follow-up. Follow-Up: Following up and following through is an intentional process that gives life to information cards. It’s recognizing what people need, when they need it, and provides you the tools and insight to connect with them intimately. It will also help identify opportunities for pastoral ministry. Follow-up helps the pastor engage individuals when they need pastoral ministry through information gathering that provides the dates, milestones and prayer requests that connect people when it matters most. Connection: Many churches confuse attendance with connection. People who feel intrinsically connected to their church – that they are valued and that they matter – are people ready to delve deeper into their relationship with Christ. Connection marks the end of assimilation and the beginning of discipleship. People often connect to church when they develop meaningful relationships, and helping them connect at a deeper level in your church creates opportunities for responsibility and ownership. Because when people feel that their church is intimately invested in them, they are more likely to sacrificially and intimately invest in their church – becoming members, givers, servers and volunteers, and ultimately, intentional disciples. Every church – of every size – must have a process that supports a fully functioning system to ensure no one gets lost, left out or overlooked. Because while no data should ever be more significant than the people it represents, that data facilitates assimilation. And the more powerful your assimilation process, the more powerful your church will be. When guests – new and returning – arrive, take care to treat them as you would a guest in your home – thoughtfully, warmly and with a comforting joy that acknowledges the value of their presence. Because ultimately, we as church leaders are responsible for the people who come through our doors. And as a godly leader, when you help ready a heart to be receptive to God and He is allowed to infiltrate everything they do, you are cultivating intentional disciples and stewarding the people God has brought through your doors to serve Him. Want to learn more about an effective assimilation process? Connect with an Auxano Navigator today. > Read more from Church Community Builder. If you aren’t clear on your ministry ends you will always measure your ministry means. Think about it. If it’s easy to confuse ends and means than this becomes the most important distinction to lead by. I hate to break it to you as ministry leaders, but leading in the church is the MOST difficult environment to maintain this clarity. How can immediately know where you stand with this distinction? If you don’t have clear language for both ministry means and ministry ends, you will necessarily be measuring means only. For example, a ministry means is a small group. If your church has small groups you will have some language for this environment— home teams, life groups, etc. Ministry ends, on the other hand, is what that small group should produce, or facilitate or aim at in the life of an individual. 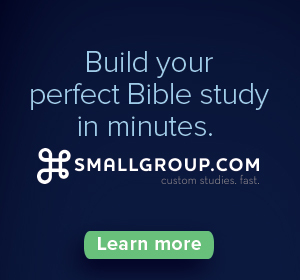 Do your group leaders know the ministry ends for a small group? Have you every clarified your ministry ends as a church? What kind of disciple is your church designed to produce? 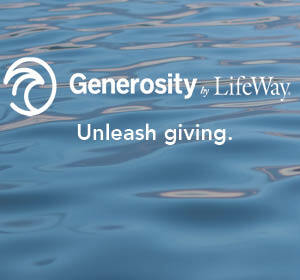 Have you ever measured anything other than attendance and giving? What are the God results and spiritual output that you are really after? Do you think attendance alone is an adequate way to assess the accomplishment of the mission? How many 2:00am friends people have? How many people have experienced meaningful accountability? How many leaders have mentored other leaders? The confidence level of sharing the gospel? How many people have crossed a cultural boundary for Jesus? The level fulfillment of being a missionary in the workplace? Lead with the end in mind. If you ask 100 church leaders to define assimilation, you’ll probably get 100 different answers. Some might say it’s all about creating relationships. Others might say it’s when a new member joins the church. For us, the best way to define assimilation is with a metaphor. In the same way that an engine is composed of multiple parts all working together to move a vehicle in one direction, effective assimilation is a system that involves many different areas working together to move people from first-time visitors to fully engaged members. It’s a process that begins with a person’s first visit to the church (for any reason) and ends when that person becomes connected to the people, ministries, and programs that drive the mission. 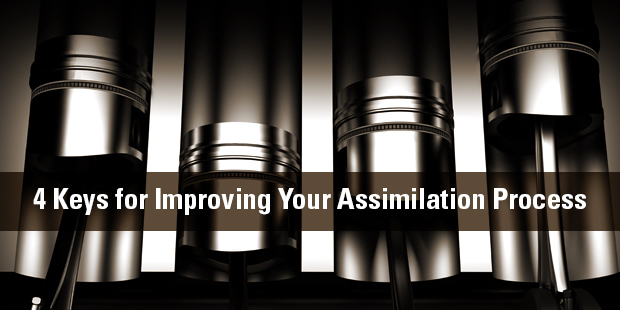 We’ve identified four keys to help you improve and streamline your assimilation process. It is often the case in ministry that there is so much to do and too little time. Sometimes all you can do is barely keep your head afloat. It can seem daunting to imagine having the time to stop, strategize, and learn a new system. However, taking the time to think through your church assimilation process might be the single most effective choice you can make in your ministry. Having a systematic approach to your assimilation process is imperative to ensuring that no one is overlooked and that your church is not leaking people. It’s tough to know whether your assimilation process is providing enough opportunity for life change without taking a step back and evaluating your process. After having evaluated your church’s current assimilation process, what are some of the areas that need immediate attention? 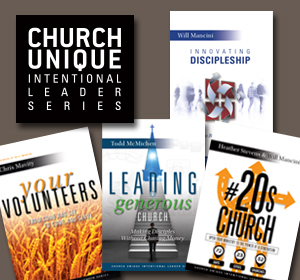 What role do each of these play in ensuring your church’s growth keeps… well, growing? Each church’s assimilation process will be unique. However, after working with many of our church partners at Church Community Builder we have identified four primary areas or processes that often need attention: Hospitality, Information Gathering, Follow-Up, and Connection. They end up mapping out how a new visitor is integrated into their community. This helps them remember the new visitor experiences. They develop a process that can be replicated and reproduced. These are critical to the success of your ministry, and should regularly be assessed and tweaked. They’re able to measure what’s working and what isn’t. You can’t manage what you don’t measure. They place a higher percentage of attenders into small groups. Active small group participants are more likely to be faithful givers, volunteers, and lay leaders. They have greater success connecting people with volunteer opportunities that match their passions and abilities. Just filling slots leads to burnout; matching people to positions leads to breakthrough. Their churches are producing active leaders instead of frozen chosen. They make it more comfortable for people to get involved that just sit and consume. They discover ministry opportunities they didn’t know existed. God has given your members unique gifts and a purpose that he wants to fulfill through your church. That purpose might be something you hadn’t considered before. Leverage technology to measure the results of your process. Your church management system has the ability to make assimilation more efficient and effective. In addition to helping you distribute workloads, it can provide a place for recording and measuring the effectiveness of your process. The larger your church becomes, the more moving pieces there are, and the more you can your staff will need to depend on robust technology designed to accelerate the rate your people grow, connect, and engage with the long-term vision and development of your church. There’s a quote that reads: “If you want something you’ve never had before, you have to do something you’ve never done before.” And there’s probably a list of things that you’d like to do to help your church reach more people and move those people along the pathway of discipleship. However, you can’t keep doing the same things and expecting different results. Discipleship suffers without a good assimilation process that facilitates moving people into a deeper relationship with Christ, people struggle to connect, first-time visitors are discouraged as there is nothing in place for them to move forward and connect with the church and it’s vision, and your backdoor remains just as open as your frontdoor. The end result: overall church health decays because there is no plan in place to help people keep growing. Maybe your assimilation process needs a quick pulse check, maybe it needs some surgery, or even a complete overhaul, one thing we know for certain is that it is essential to building a thriving ministry. 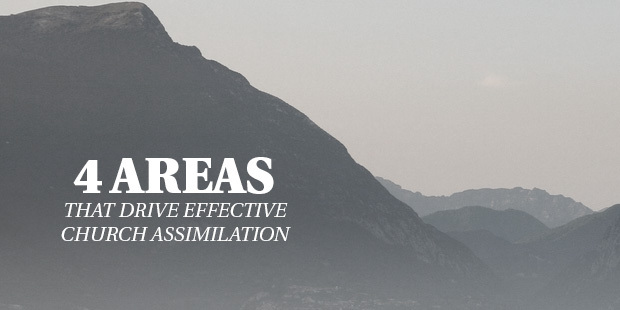 The more powerful the assimilation process, the more powerful your church will be. Outline your church’s assimilation process. Document it. Assess the effectiveness of your current process. How are you doing in the 4 primary areas we identified? Learn more about improving your assimilation process – connect with an Auxano Navigator today. My friend is excellent at taking the complex and making it simple. I love having her on the team because she really makes it possible to replicate. The simpler anything is, the easier it is to repeat. The more complex, the more difficult to pass it on. It’s hard for me to think of anything that I do now naturally that didn’t begin with some simple, repeatable actions that were within my grasp to do. Even overwhelming, “stretch me” kind of challenges began with a simple, repeatable step. There is no movement without reproduction. And there is no reproduction without small repeatable patterns. Get them to share their story. Get them to live in community. Where have you seen God this week? What discussions are you having with those who are far from God? What good can we do around here? How can we lift each other up in prayer? Welcome-we share our lives with each other around food and fellowship. Worship-we experience the presence of God and experiment with different ways of responding. Word-the Scripture holds a sacred, central place in our gatherings. Witness-we consider how we might bless our community and engage our friends who are far from God (impact lists). One of the main reasons why we are not seeing the multiplication of new believers and discipling relationships in the church in America is because we have allowed our ministries to become so complex that only a few can truly participate. We have not done the hard work of distilling down our systems to the smallest repeatable pattern. In my work with Auxano we call this effort of intentional integration a “Duplicatable Process”. Anything in ministry you hope to reproduce must be broken down into simple repeatable patterns (fractals). Only then, will there be any movement. So, spend time considering such things. Watch Jesus. Discuss and discern with your leaders. Engage and employ a strategic outsider like Auxano. Ask God for clarity. Decide and synthesize your language. Live it with joy to the glory of God. And, as you do, invite others to join you and imitate you. Read more from Jeff here. I am Jeff Meyer, and I start fires. Ever since that basketball game in college when I came off the bench and lit a spark for my team, I have carried the nickname "Fire Meyer." (Until that point in my career my jersey #22 never saw the floor in an actual game. Perhaps the #22 was a symbol of my life calling: 2 Timothy 2:2?) I live to see sparks ignited and connections made. I long to see the church wake up and live. I long to see Jesus-followers display passionate commitment to Jesus. Jesus' invitation to follow Him was an adventure of epic proportions. Can we recapture that today? I long to see communities transformed into healthy places of wholeness. I believe that communities are transformed when Jesus-followers are stoked and respond. Perhaps you've heard it said that the church is the hope of the world. I believe that a responsive Jesus-follower is the hope of the world. "Igniting connections" is my way of setting off some inspirational sparks; sparks that ignite a passionate response to the call of Jesus. 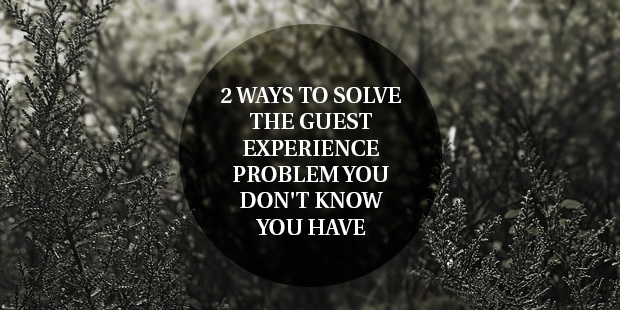 How Great Can Your Guest Experience Really Be? They belong to the team members who are the “first face” of your church – parking lot crews, greeters, ushers – anyone who is making the first impression with your Guests. They also represent the space and distance where the words you use and the actions you take make the most powerful impact with your Guest. The interactions that take place in that space (two feet) by your team member (two feet) are rich with expectations – and can also be filled with missed opportunities. In that space your front-line team members have become the face and voice of your organization. Creating an Exceptional Guest Experience comes down to having great people on your front line teams and training them well. 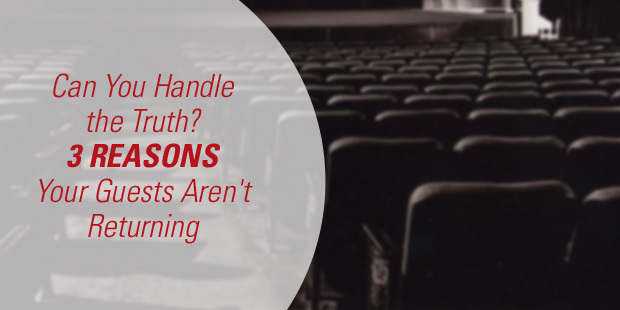 Many churches struggle with Guest services. Often the primary barrier is translating the organization’s vision into action at the front line. An article in HBR.org outlined four activities that your church can learn from when it comes to your front line teams. Listen to team members. 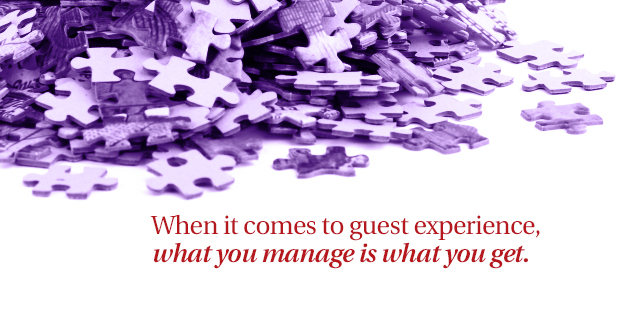 Want your team to take great care of your Guest? Start by taking great care of them. Hire for attitude, not aptitude — and then reinforce attitude. To get friendly service, enlist friendly people. Having selected people with the right attitudes, leaders need to ensure they reinforce the behaviors they want to see. Give people purpose, not rules. Rules have their place, but they go only so far. When people are given clear expectations and trusted to do their jobs, they feel valued and empowered. They choose to go that extra mile through passion, not compliance. Tap into the creativity of your front line. Giving frontline team members responsibility and autonomy inspires them to do whatever they can to improve the Guest experience. When they see a problem, they fix it without waiting to be asked. Engaging with Guests is primarily through personal contact, and that starts on the front lines with your team. The care and energy your teams use to connect with Guests reflect the care and energy you as a leader use to connect with your team. How your front line teams represent your church – what they do (or don’t do), what they say (or don’t say) – that’s the powerful human “first impression” your Guest is experiencing – and will remember. Remember that Churches are different from businesses. More important in a church setting than the staff being friendly and welcoming is if the church people themselves are friendly and welcoming. It is a difficult thing to teach. It is difficult enough to teach Christians to give a percentage of their wealth to God, teaching Christians to give a percentage of their lives to God by being friendly towards and friends with people who will never have any network value is even more difficult. Yes! In 2013 Houston Methodist West Hospital Ambulatory Surgery Patient Satisfaction Scores ranked above superior in all quarters. This has placed our hospital Outpatient Surgery Department in the top 10th percentile nationally!!! Our staff and front line volunteers live the ICARE values providing a positive Methodist Experience and personalized care for our patients! 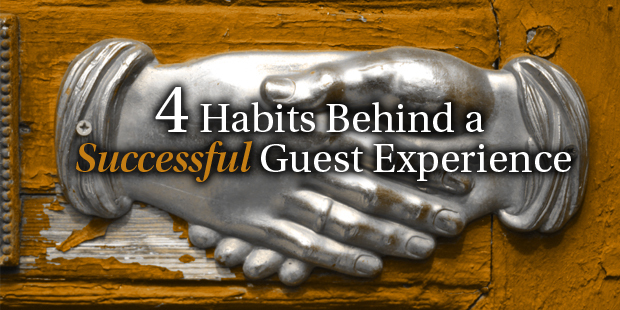 I believe in the 4 habits of a successful Guest Experience! All pastors know the feeling. A new couple visits on a Sunday morning. Maybe they just moved to the area and they are looking for a church, or a friend invited them, or they decided to give church a try. They seem really sharp, exactly the demographic you are trying to reach. You have a great conversation in the lobby. They promise to be back next week, but they’re not. They never come back. Another family comes three weeks in a row. Each weekend you see them in the lobby after church and it seems like they are really connecting. They miss the fourth week, but they’re back on the fifth. And then they never come back. What happened? Why didn’t these families connect? Why do so many people flow through your church without sticking? You’ve read the books, been to the conferences and tried everything you can think of, but the back door of your church is always wide open. What is going on? Actually the more you think you’re not a members only club the more likely you are. Guests are just that, guests. They are welcome to watch and even participate, but they are not a part of the club. Walking into the church is like walking around in a foreign country. There are signs with clever labels like “Treasure Cove”, “Warehouse” and “Waves” that mean absolutely nothing to the outsider. Your announcements are laced with insider language about ministries and programs that everyone, wink-wink-nod-nod, already knows about. Sermons are filled with inside jokes and references to individuals that an outsider knows nothing about. You even have special shirts and name badges to clearly delineate who belongs and who does not. The effort required to learn your language, understand your references and get to know your members is just too challenging for the new attender, so they don’t come back. You don’t mean to be a members only club, you just are. The first time attender showed up a few minutes after your website said your services start because they wanted to sneak in the back, but when they arrived the band wasn’t even on stage. The auditorium was almost empty when they sat down, which made it easy for the pastor to find them. He explained that the congregation is notoriously late, but the service will start in a few minutes. The new attender can’t help but wonder why the church leaders care so little about details. Maybe that’s the way they treat people as well? Its not really worth the effort to find out. There may be room in the parking lot and the auditorium, but everything else is full. Your small groups are closed, but you have new ones starting the fall if the new attender wants to come back in a few weeks. Your ministry teams are full unless the new attender wants to wipe babies butts, in that case there’s an opening today. Your leader’s slate of relationships is full; they’ll meet with the new attender, but they reached their quota of friends a few months ago. There’s a place to park and a place to sit, but there’s really no place to belong. This is confusing and a little embarrassing for the new attender. At least when hotels are full they put out a no vacancy sign; your church talks like they have plenty of room even though every available slot, or at least desirable slot, is full. Maybe they’d be better off sticking with meetup.com to find new connections, there’s always room there. Have you ever visited a church and then didn’t go back? What are top two or three reasons you didn’t return? Church is to bring in the lost, to save souls. If you're a believer and come to a church to seek what it can do for you, instead of what you can do for the church, then your in it to be served and not to serve. It's not about you and what you want, it's about the Kingdom and glorifying God. Do your part to help not to run because you don't feel good about the church. True Christians seek God in Spirit and in Truth, all others are seeking a savior and need help getting to there destiny. Help to do the vision, not criticise others for not doing it the way you want. We are one body with different parts moving towards the same purpose. Salvation!! The main reason i don't return is because the preacher didn't prepare, or maybe he just isn't a good preacher. Sometimes it's because they are too fluffy with their beliefs, "God aint mad at you" and every body is tip toeing through the tulips. The main reason why I believe someone does not come back is a lack of follow up by the church. It is odd to me but the majority of the time that we have visited a church, there has been no follow up. Even more concerning, we have never seen a pastor follow up. My advice to churches is to have a pastor follow up with every visitor and then Shepard them based on their need which could include helping to connect them to another church. #3 seems to be quite common around me. They don't have room for me to get involved in anything, but they sure manage to send out multiple requests for my money every month. It seems like everyone's standards are pretty high. I would think that if people are going to give a church only one try to come up to their standards, they may never find a church home. I remember several years ago we had two or three groups of new people who complained that we did not sing the hymns that they were used to. So we added some of the hymns they suggested, but they left anyway. Maybe new people could try appreciating what they find when they go o a new church, instead of setting their standards so high that few churches can meet them. I have not had reason to look for a new church for many years, although I visit other churches on occasion. Maybe that new church that doesn't measure up to your standards has something different and special to offer that will enrich your lives. And what is awful music? I think that my church has terrific music, but if someone new comes and doesn't like it, then it becomes awful music. I guess I feel that instead of looking for the perfect church, people might go with the attitude that they will become part of the community and offer something to the life of the church. It's a two-way proposition. It seems this was written awhile ago but I would like to respond. Mr. Surratt makes great points. Points that should be taken seriously by all churches. I just do not think these points are the main reason people are not coming back to churches. Who knows the exact reason why anyone does not come back unless they tell you, but I can say with certainty the reasons I do not return are usually the same. 1. Love, tolerance, and acceptance. (unbelievers, baby Christians) Church members seem to want their guests or potential members to behave a certain way. They want them to conform to the system that is already in place. In some ways this is understandable. In other ways, it is isolating to the guest. They want to feel loved and accepted the way they are. They want to be told everything is ok no matter their past. They want to be given time to work out their immediate more pressing issues without having to worry about what to wear and how to talk (church speak). 2. Love, tolerance, and acceptance (believers, unchurched) Many times, these people are looking for what fits their already preconceived ideas of what "good churches" are. These preconceived notions are difficult to overcome and some of them were addressed in Mr. Surratt's article. But I can tell you that a truly loving, a truly tolerant, and a truly accepting church can overcome most of these things. You may never be able to overcome a taste in music, or a theological difference, but most everything else can be healed with Love. 3. People can see the business aspect of the church. I see it almost immediately when I walk into certain churches for the first time. I think people understand that a church has many aspects of itself that are business oriented. I just believe they dont want to experience these aspects when they visit. How many churches are so focused on growth, in numbers of bodies, that they forget the growth of the heart? The American church is now fully Americanized. Its a show and a numbers game. People come to church, especially new comers, CRAVING to fill a void in their life. If you are offering the same thing they can get in the real world, how are you any different? There are plenty of other reasons people do not return and many may not be avoidable. However, the church as a whole needs to reevaluate the arena in which they are playing. The simplicity of the Gospel is good enough to fulfill the hearts of the unbelievers and restore the prodigal's to a relationship with Christ. Love thy neighbor as thyself and love thy God with all your heart. "You even have special shirts and name badges to clearly delineate who belongs and who does not." Now a short while back I was told by some of you growth gurus that we needed name tags and same colored polos so people would know who to ask directions or other info from. Which is it? Personally I think that a major part of the problem, and this becoming more transparent today, is this assumption and assertion that church is about emotionalism. Why make the assumption in this article that a church has a "band"? Some churches still embrace a certain level of reverence and respect -- they attempt to make church something different, something more transcendent than day to day car radio, night club, social media environment. First church is NOT just an emotional time where people come together like-mindedly and feel good about themselves. You see, our culture is so lost and so desperate for something that the people will fill that emptiness with anything that gives them a high, even if its only temporary. Is that what church is meant to be? Is it a drug, given in the name of God? Come together, have some coffee and rolls and sing songs that temporarily fill a void? I don't think so. Second, what church should be offering is the Word of God! The main focus in worship is the teaching - the faith - the confession - the meditation - the prayer - the day-to-day LIFE of God's people sort of summed up in an hour and a half. I mean if God's children are supposed to be running around with their hands in the air all day long singing "breathe" I guess it's one thing...but what are they learning from that? No. In church people must learn to repent, to believe in Christ as their salvation, to delve into the Word of God, to learn humility, to learn to be passive-receiving from God His gifts rather than thinking they must do something or sing louder or raise their hands higher to get them. They must learn about sin, and the effect of sin in their lives, so that they can truly rejoice and thank God for the wonderful gifts of salvation, grace, eternal life, and forgiveness of sins in a LIFELONG way and not as an emotional high. Church must be something different, something that goes BEYOND the culture and thus has the ability to reach INTO culture to get to the lost. Church must display the transcendence and the holiness of God, but it must also show the closeness and the intimacy of the Father shared in Christ. What church has become today is a business-show. It's not church but it's entertainment. It's like drinking the milk where God wants to get us to solid food. Yeah we don't want to become stagnant and hypocritical by following a bunch of rituals for rituals' sake, but we also don't want to abandon the ritual of the church in order to try to look like the culture around us. I like a lot of praise music, but sometimes I think it's an infiltration of culture and worldliness into the church (rather than the Church changing and leading culture). Thus when I choose praise music (or any music) for church, it must first and foremost TEACH THE FAITH, not just make people jump up and down, cry, and become emotional robots. While I agree with the premise of this article, I do NOT agree with the assumptions or the assertions. There are times when an organ and a hymn is far FAR better than a band where the musicians wear jeans and dress like they just came from a night club. I believe we should show some air of reverence when we are in the presence of God and when we are teaching the faith corporately. Certainly timeliness, cleanliness, and true hospitality are important, but for me these are not the decisive factors in finding a church home. These factors are frosting on the cake, and can be improved over time. What I want to find in a church is a pastor and membership focused upon loving God, and loving their neighbors (and visitors) as themselves. A church with a high view of God, a low view of man. A church truly transformed by God's spirit. Born from above and giving the credit to God. A church like this cannot help but grow. Ask yourself why the people who DO come back, do so. It'll probably have less to do with parking or seating or timing, than it does with something going on that draws them back. We visit many churches in the past due to our occupations, but now, settling down, I never thought we would have a problem of "finding a church home". First, it was apparent We simply have nothing in common, except, of course Jesus. I thought that would be enough. But, I was wrong. The cliques are strong and the singing/music is aweful. We tried for months to make it work, but when my wife started crying on the way to service, I caught myself saying "it isn't about the worship" its about plugging into the Body of Christ...it dawned on me, we had to go somewhere else. The second place we visited and left was also due to cliques, poor proper exegesis of Scripture and they had no idea of ther mission to their community. It was a pep-rally sermon format with poor music, no discipleship and no room. The last place where we are currently attending has reduced us to Sunday morning only (SMO as they call it) due to the Bible studies being monopolized by a leader who approaches Scripture using propositions because they "think" or "feel" it should be so...again, no formal exegesis. I feel terible for even commenting like this, but, you asked. We've stopped looking elsewhere, and resigned ourselves to sit in the back and wait for openings. The team at Auxano enjoys playing the role of “secret worshipper” when we take a church through our visioning process called the Vision Pathway. We call it a Guest Perspective Evaluation. As I prepare to debrief a church again tomorrow, I want to share some general insights on welcoming ministry and hospitality for guests. #1 Volunteers have not thought in advance about my next step as a guest so they don’t know how to guide the conversation with me. #2 Volunteers are talking with friends and don’t notice me. #3 Volunteers are doing task work and are not available or responsive the moment I show up. #4 Volunteers generally hesitate when I initiate with a question. #5 Volunteers don’t know where the most pertinent information is located. #6 Volunteers tell me what to do with no information or tools or other people to help me. #7 Volunteers generally look preoccupied, distracted or unsure of themselves in their non-verbals even when being friendly. #8 Volunteers are unaware of the basic “how to” questions for checking-in children of every age. #9 Volunteers don’t introduce me to others at the church. #10 Volunteers gave me written information that is not important, pertinent or strategic (sending me on a bee-line to the trash can). 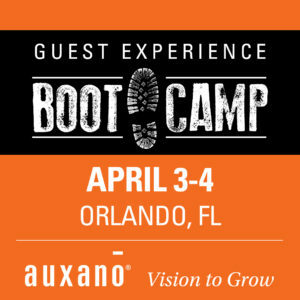 If you want more resources on welcoming ministry and church guest services, check out additional information on VisionRoom.com and follow Bob Adams who works as Auxano’s Vision Room Curator and Guest Services maven. Here is a list of resources on his blog and a recent post on Where Does Your Guest Experience Start? My team and I want to connect with you. Fill out this short form and one of our Navigators will contact you. Every area of ministry in your church is enhanced when you focus on developing an effective assimilation process. Discipleship thrives because there’s a process in place to move people into a deeper relationship with Christ. Community flourishes because people feel connected. Overall church health improves because there’s a plan in place to help people continually grow. There are two elements to successful hospitality—passive hospitality and active hospitality. Passive hospitality includes directional signs and maps that make navigating the campus easier. Active hospitality involves real people who watch for ways to assist anyone entering the facility. 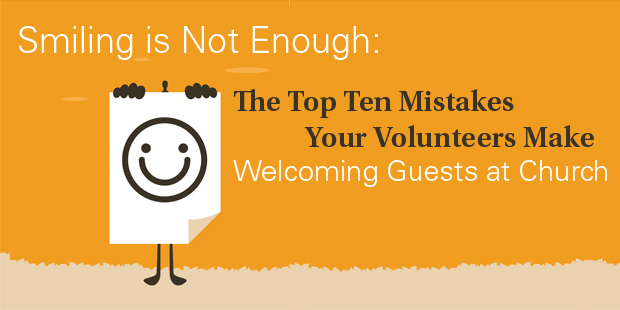 Are your volunteers trained and equipped to provide the kind of active hospitality needed to make first-time guests feel welcome? 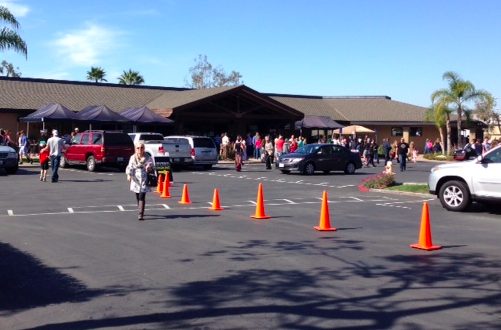 It is overwhelming when churches provide too many ways for the first-time visitor to connect. Don’t provide a catalog of options. Make it very simple and clear. Provide one or two primary options for taking the next step. As people move deeper, you can record more valuable information to increase the level of commitment. Do you have a simple process for intentionally gathering information that helps you connect with every single person who walks through your doors on Sunday? This doesn’t require a lot of creativity — simply follow up with your visitors and say hello. While this may seem too easy, it is important to evaluate your process regularly! Effective follow-up should help your members and visitors experience one-on-one ministry. Is your follow-up process leading to more relational connections with the people in your church or are you letting people slip through the cracks? This step is the end of assimilation and the beginning of discipleship. There should be a smooth handoff to someone who can guide people to go deeper in their relationship with God and their connection to the church. If you aren’t assimilating people, you will be increasing the number of spectators rather than growing strength in the Body of Christ through active disciples. How are you moving people from visiting your church to becoming active members? The difference between a church that has successful assimilation and one that doesn’t is how well these parts are working individually and collectively. If any of these four areas in your church’s assimilation process need a “tune up,” check out “The Assimilation Engine.” Effective assimilation can multiply your ministry efforts and maximize your Kingdom impact. Is your church’s assimilation engine running well? What area needs the most improvement? In my blog I have referred many times to my days of church consultation, particularly those experiences where we sent one of our consultants to be a first-time guest in a church. He or she would return with a report of those experiences, and the report would eventually be consolidated with other information for the church. I have nearly 300 of these “mystery guest” reports. Both Chuck Lawless and I have posted about them on this blog. In the past, the mystery guests would “grade” the visit based on several criteria. Less than 20 percent of these reports were graded “B” (good visit) or higher. Did you get that? Less than 20 percent of the guests said their visit was good, but 90 percent of the pastors perceive the opposite, that most guests have a good visit. Why is there such a discrepancy between the pastors’ perceptions and the real experiences of the guests? May I suggest five reasons many pastors have blindness regarding the first-time guests? Gradual slippage is hard to detect. The pastors see the church almost every day. Daily deterioration of the facilities and slight slippage in ministries are almost impossible to detect. Over time, though, the slippage can become a major deficiency. Relationships can blind them to reality. The pastor has many good relationships in the church. The people he knows are friendly to each other and to him. He does not perceive that they are not so friendly to strangers. The pastor has received positive feedback from some guests. But the pastor rarely hears from those who have had a bad experience. The pastor does not intentionally ask for feedback from all guests. There is no system in place that attempts to hear from everyone who visits. The feedback from members is positive. Pastors and members often feel positive about the friendliness of members to one another. The pastor then assumes the members’ attitude and friendliness to each other is the same for guests. When I was a pastor, I took two approaches to keeping myself grounded and aware of how our church was perceived by guests. I subsequently used it as a church consultant with a lot of success. First, I hired two mystery guests to visit our church. Each visit was six months apart. I paid them a small stipend for their efforts. One of the guests would be a Christian and a regular churchgoer. But he or she could have never been to our church before. The other person was not a Christian and, likewise, never visited our church. I gave them a form to complete and left room for open comments. Their insights were invaluable. Second, each guest who was willing to complete a guest card received a letter from me. Included in the letter were a $10 gift card to Baskin Robbins and a stamped response form. We specifically asked them not to use their names, and to write frankly about their experiences at our church. We often received many of these evaluations back; they were of tremendous value in helping us discern how guests perceived us. So why do you think pastors have such a positive view of the guest experiences of their church? What would you do to stay better informed? *LifeWay Research conducted a telephone survey of 1,007 Protestant pastors from September 4-19, 2013. The calling list was a stratified random sample of all Protestant churches. Each interview was conducted with the senior pastor, minister, or equivalent. Responses were weighted to reflect the geographic distribution and denominational (or non-denominational) groups of Protestant churches. The complete sample provides 95% confidence that the sampling error does not exceed +/- 3.1%. The one thing that would make this article better would be to include the forms that were used or a sample of a form that could be used to give to the "mystery guests" as well as what was used for the guests that completed a visitor card. How often have you experienced unfriendly or grumpy service on an airline, in a restaurant, or in another service environment? Quite a few times, I imagine. In the vast majority of cases, I would take a bet that this is not so much a result of poor hiring or training, but a reflection of a poor internal culture. Service brands often use the vocabulary of theater to describe what good service looks like. They talk about “performance,” “scripts,” and “stages” when instructing their staff. However, they forget one crucial difference between acting and working as a service provider. On the stage, the performer has a chance to prepare, and can treat the moment as a separate experience. A sales clerk in a retail environment has to cope with unpredictable customers and shifting levels of demand — never having the opportunity to distinguish the “performance” from the rest of the job. When brands attempt to script their service performance, but do not give equal attention to their internal culture, it should be no wonder that these organizations inevitably fail to meet consistent service standards. Companies that have combative relationships with their employees, or fail to engage staff in a respectful way, risk seeing these same negative attitudes filter into staff interactions with customers. Famously great service brands — such as Nordstrom, Southwest Airlines, and Four Seasons Hotels — go out of their way to develop respectful and positive corporate cultures that act as the foundation for great service. One of my local favorites in San Francisco is Bi-Rite Market. Owners Sam and Raph Mogannam have created a positive and inclusive culture that extends beyond employees, all the way to suppliers and the local community. A few simple behaviors guide how staff interact with customers, known as “guests.” Everything else comes down to the naturally optimistic and helpful personality of staff who work in an enjoyable and supportive culture. Where might your corporate culture be obstructing your ability to deliver the best experiences to your customers? Culture is the key...I think the internal culture of an organization is the toughest thing leaders of organizations face. Cracking the culture code has been no easy task for me. Its been one step forward two steps backwards.